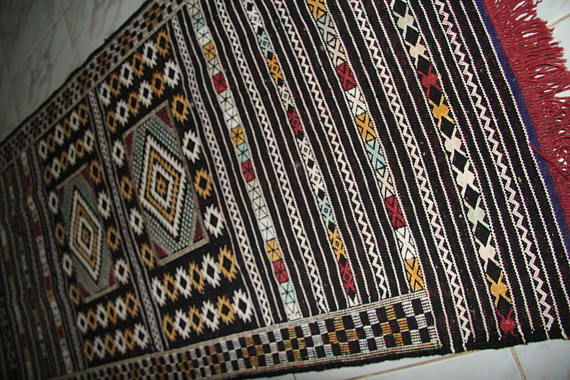 The Moroccan Kilim Sabra is a very beautiful vintage color with Berber motifs and designs. The Sabra, also called plant silk, is a fabric that resembles silk by its look and feel, tied at the hand of craftswomen Berbers. This traditional kilim can integrate with all your interior styles (mature, floor, ceiling...) and will add an ethnic decorative accent and rich colors to your home.Berber Rug, also known as Sabra-Carpet or Kilim. The Sabra is a vegetable fiber derived from Aloe Vera and also called "cactus silk". The appearance and touch are like silk . "AGOUTI" is one of our selected masterpieces from Morocco. Handwoven by the Berber women of the High Atlas Mountains the rug is indigo dyed and hand-embroidered with traditional Berber signs.